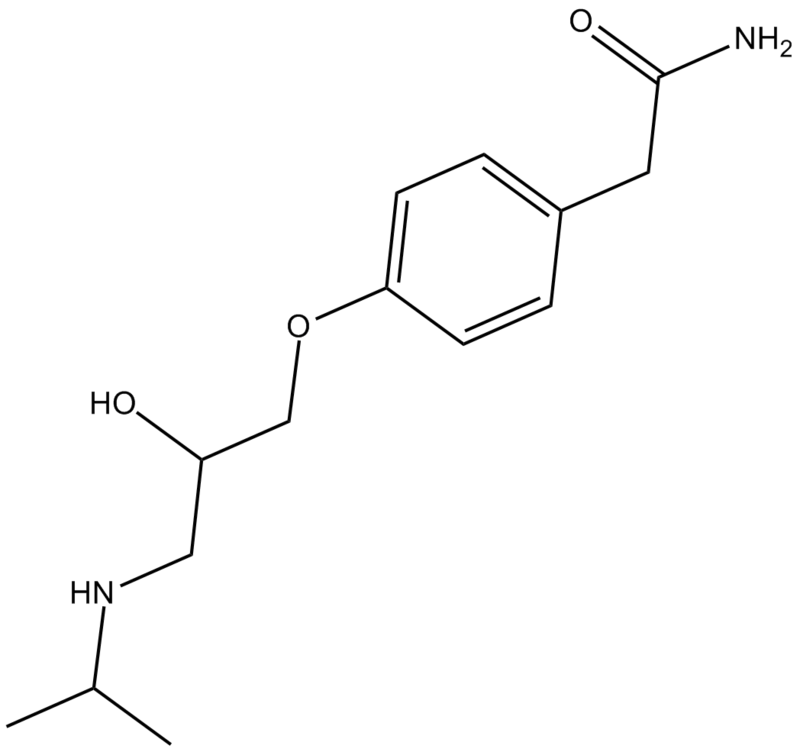 (R,S)-Atenolol is a β1-adrenergic receptor antagonist. Beta-adrenoceptor antagonists are widely used in cardiovascular medicine as well as in the management of anxiety, migraine and glaucoma. The mode of action in cardiovascular disease is from antagonism of endogenous catecholamine responses in the heart. In vitro: (R,S)-Atenolol was found to differ slightly regarding potency and to be practically equal regarding relative selectivity, while ICI 141,292 had slightly higher relative selectivity and much higher potency. (R,S)-Atenolol exhibited highest affinity for the beta 1-receptor population. In contrast, ICI 118,551 exhibited a very high relative selectivity with highest affinity for the beta 2-receptor subtype . In vivo: The renal effects of (R,S)-atenolol in rats were studied. Results showed that the iv infusion of (R,S)-atenolol increased urinary sodium excretion, urine volume (UV), urinary potassium excretion and urinary chloride excretion. (R,S)-Atenolo intraaortally injected produced an increase in UV and sodium concentration in the urine, inducing a more marked increase in total sodium amount excreted from both kidneys . Clinical trial: In a previous clinical study, the effects of single oral doses of 100 mg (R,S)-atenolol were compared to those of equal amounts of the optically pure enantiomers. The mean rate pressure product decreased with (R,S)-atenolol and half-dosed (S)-atenolol to the same extent, whereas (R)-atenolol caused no effect. Radioligand binding studies in beta-adrenergic receptors yielded a eudismic ratio of 46 for (S)- to (R)-atenolol. It was conclude that only (S)-atenolol, but not (R)-atenolol, contributed to the beta-blocking effect (R,S)-atenolol since the same effect can be elicited with the (S)-enantiomer alone . Golf, S. ,Bjornerheim, R.,Erichsen, A., et al. Relative selectivity of different β-adrenoceptor antagonists for human heart β1- and β2-receptor subtypes assayed by a radioligand binding technique. Scandinavian Journal of Clinical and Laboratory Investigation 47(7), 719-723 (1987). Yamazaki N, Monma Y, Tanabe T. Effects of propranolol and atenolol on the rat kidney. Nihon Yakurigaku Zasshi. 1983 May;81(5):333-42. Stoschitzky K, Egginger G, Zernig G, Klein W, Lindner W. Stereoselective features of (R)- and (S)-atenolol: clinical pharmacological, pharmacokinetic, and radioligand binding studies. Chirality. 1993;5(1):15-9.